- - Bloggy Blog Blog - -: What do you see? This was the question, "What do you see?" that our ultra-sound tech asked us today. A few seconds of confusion was followed by a scream and lots of laughing! There are 2 in there!!!!! I just can't believe it! 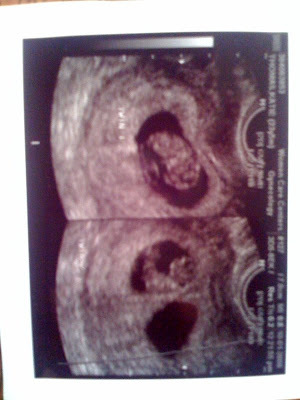 I have always wanted twins and was just telling my mom that yesterday! I didn't know that they ran in my family, I guess they do. Sean and I couldn't be happier! So, I know the picture is sideways, but it works. The sack that looks empty only looks empty, that is where the 1st twin lives, we just couldn't get a good shot of both of them. That's why there are two shots side by side. They both have good strong heart beats, and are measuring at 9 weeks! May 7th is the due date (Amanda's Birthday!)! The Doctor said, prepare to get BIG! She said in the next 2 weeks i should pop out a lot. This will be very interesting. Im excited and scared. Sean and I used to pray that we would have twins, with our 1st pregnancy, but this time, our only prayer was for a healthy baby. I guess He answered both! YAY!!!!!!!!!!!!!!!!!!!!!!!!!!!!!!!!!!!!!!!!!!!!!!!!!! i was going to say the exact thing Callie said, no joke...oh my gosh, how crazy!!!!!! WOW!!!!!!!!! that is so exciting!!! Praise the Lord!!! i am so excited...i am already planning on coming out after the babies are born!!! Yay! Love you guys and miss you, lots! Now you're gonna go and make me cry! I'm so happy for you. I texted Sean back...maybe he'll read it to you. Keeping you and the babies in my prayers. So crazy how God over and abundantly blesses us. Holy cow Katie!! So excited for you guys (all 4 of you)! YAYYY!!!! So so so SO excited for you guys!! Wow...Im blown away by God's amazing goodness! Praying for you and the little babies!! Love you! Wow! That's amazing, Katie. We are so happy for you, Sean, and your families. God is good!!!!!! Keeping you, Sean, and the babies in our prayers. Wow! Soooo excited for you guys. God is so kind! Love you very much and I'm praying for you. Wow, Katie!! That is SO exciting! I have goose bumps. :) I also read Sean's "Prego" post and laughed at his announcement of the news. :) Congratulations, you guys!! Katie, it's Jenny Mark!! I've been following your blog since it started and am SOOOOOOOO thrilled by your news! I prayed for the twins' health and protection right on the spot, and that God will provide abundantly for all four of you. He is so faithful. Wow! Fantastic news. And such a reminder of how God blesses beyond what we can imagine. Just remember that when the belly gets bigger...it's a blessing! Holy cow!!!! Congratulations! Sooooooo exciting! :) Make sure you take good care of yourself. Love you!! !